The Acme.F range front access valve regulated lead acid batteries is designed with real front access structure. The state-of the-art internal and external design ensures Acme.F the high reliability and makes the installation squite simple and safe when placed on a standard relay rack tray or in a closed cabinet. 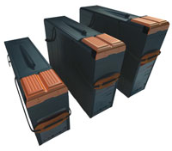 Acme.F range VRLA battery is designed with high energy density and suitable for 19". 23" rack or cabinet. Acme.F also offers options of top connection and side of monoblocs connection. The terminal protector for Acme.F batteries are designed with special probe hole allowing safe and easier voltage testing and suitable for all connection means. The prmium Acme.F batteries are ensured the quality with NARADA's QA system according to the ISO90001 and ISO14001 standard.